You may remember how much I love the original (read here) - I bought it as soon as it came out and used it everyday until it ran out earlier this year! Since then I have been using just my Nivea Hydration Primer most days but I have been really missing using Babyskin alongside it so I have been waiting,waiting,waiting for this beaut to be released! This stuff comes in two shades - Cool Rose & Apricot. I went for the cool rose as I thought it was super pretty, like a pinky highlighter-type primer, which is my kinda thing! The texture of the product is alot creamier and more lotion-like than the original pore eraser which I wasn't expecting when I first squirt it out... definitely wasted a bit, darn it! I just use my fingers to put this on. Dot it all over my face and blend it in. It glides onto the skin easily and leaves it feeling silky and ready for the rest of my make-up to get slapped on my face. It gives my skin a lovely even fresh glow, and definitely makes it look less dull even when I'm lacking sleep! I'm all about glowing skin - I will use anything and everything! 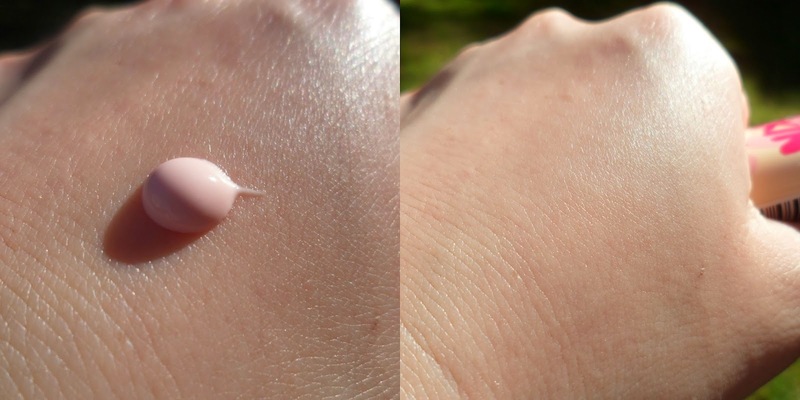 This is a water-based primer which helps make the skin feel hydrated, perfect for the draining summer months. I work within an air-conned building so sometimes I feel like the moisture is being drained from my skin... anyone else feel this pain? This looks lovely! I've yet to try the babyskin primer but I've read a lot of good things about it, so I'll have to give it a go soon! Oohhh this looks gorgeous, I am glad to see they have moved away from the silicone original BabySkin and gone for a more hydrating primer. Thanks for the review, I am a huge BB cream addict and it is always nice to read reviews about them before bying them. I think I need to give this one a go now! Absolutely love your blog! I cannot believe I've just discovered it! I need to try this product so bad! Exciting! I loved the original so I'm sure this would be right up my alley. I lov this product! I'm using the cool rose like you because my face skin is cooler then the rest of my body. It leaves me with a smooth and radiant face, while my dark circles are way, way lighter and ready for the concealer (I can use less now!). In my opinion, it's a perfect primer/perfector! Seeing now that this is a water based primer, I cant wait to try it. Silicone primers don't like my skin very much. Thanks for reviewing this!